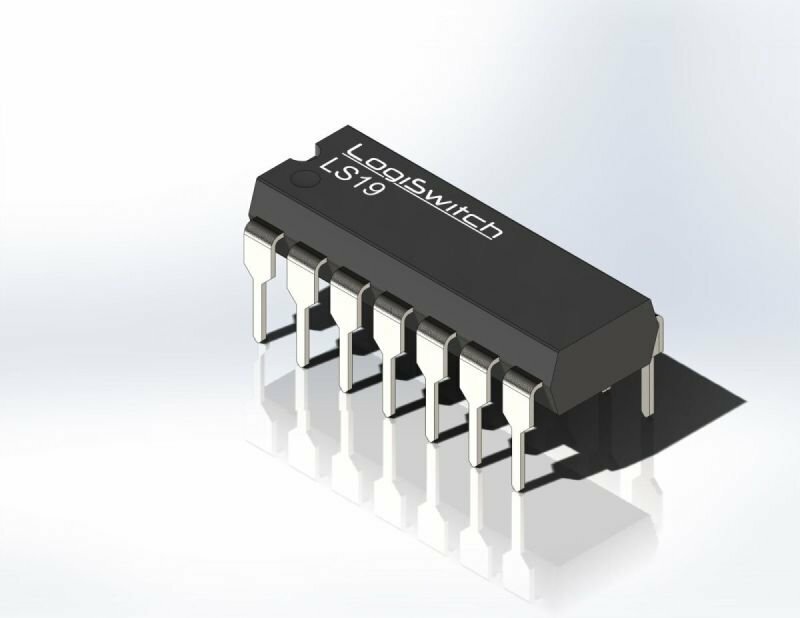 Technical Leader of Debouncer Integrated Circuits and Bounce-Free Switches of Unparalled Quality. 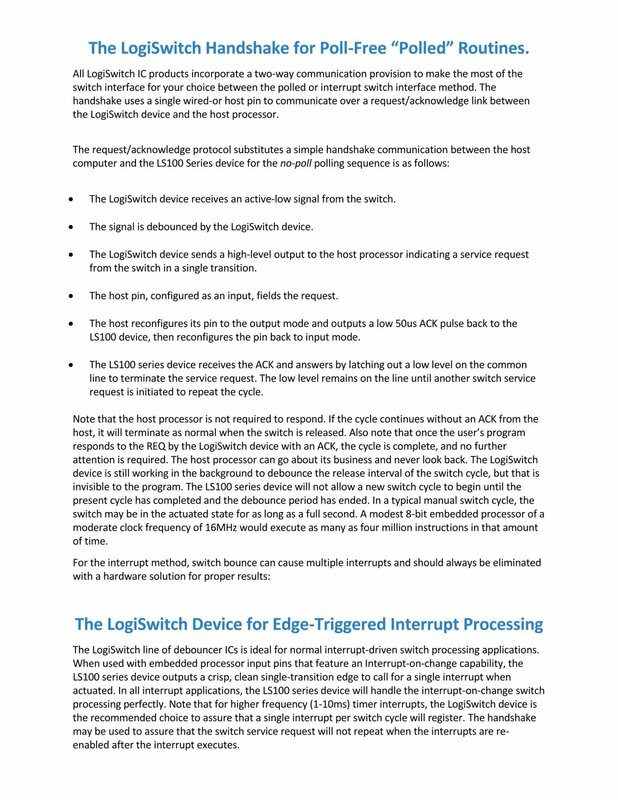 LogiSwitch Now Includes its Poll-saving Handshake Protocol on All Switches and selected IC Products. Polling is a Notorious Time Sink. It Causes All MCU Activity To Cease Until The Switch is Released. 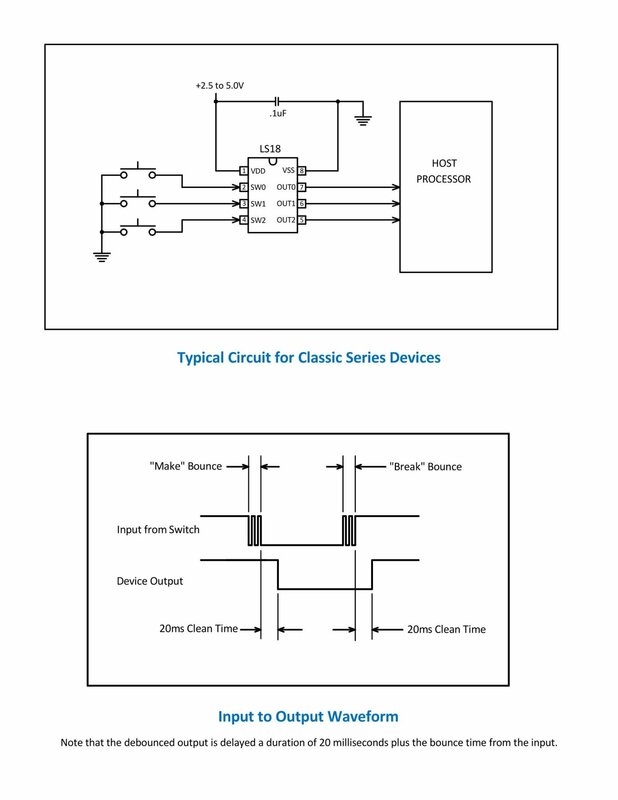 The Classic Original Three-Channel Switch Debouncer IC for Embedded Processors in an 8-pin PDIP package. 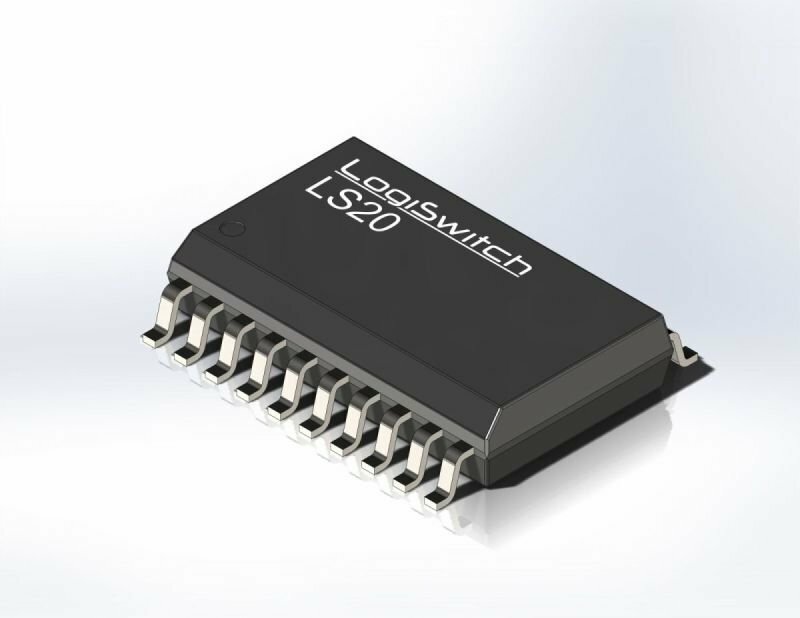 LogiSwitch Classic devices provide 25 milliamp totem-pole outputs. 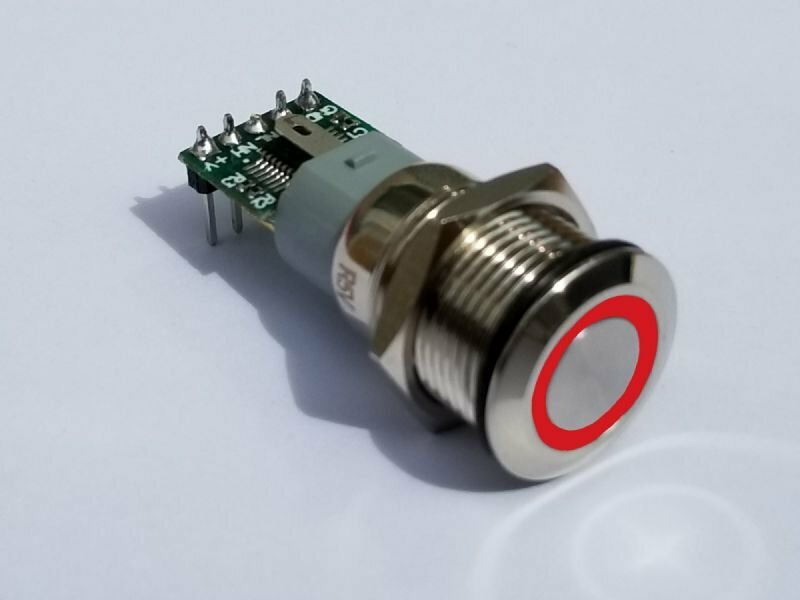 Inputs and outputs are of the same polarity, active high or active low. 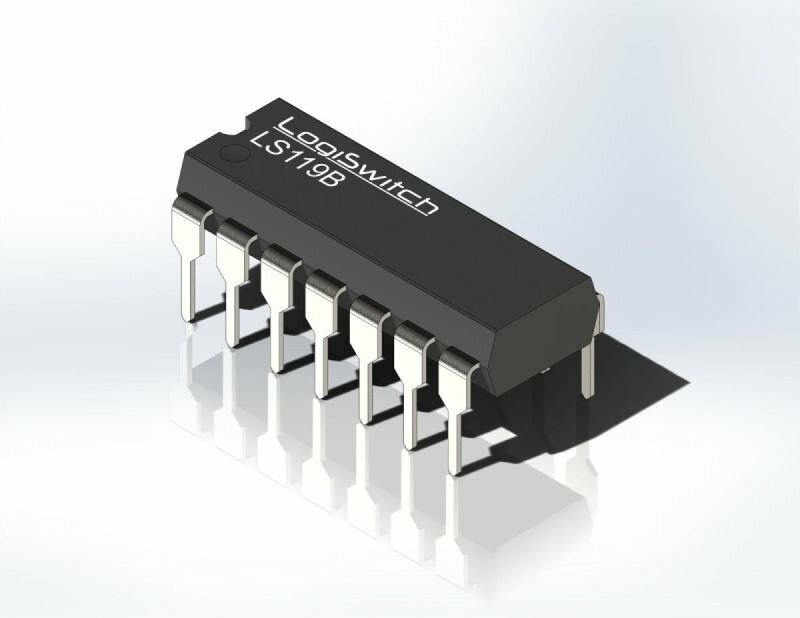 The Classic Original Three-Channel Switch Debouncer IC for Embedded Processors in a 150 mil SOIC-8 package. 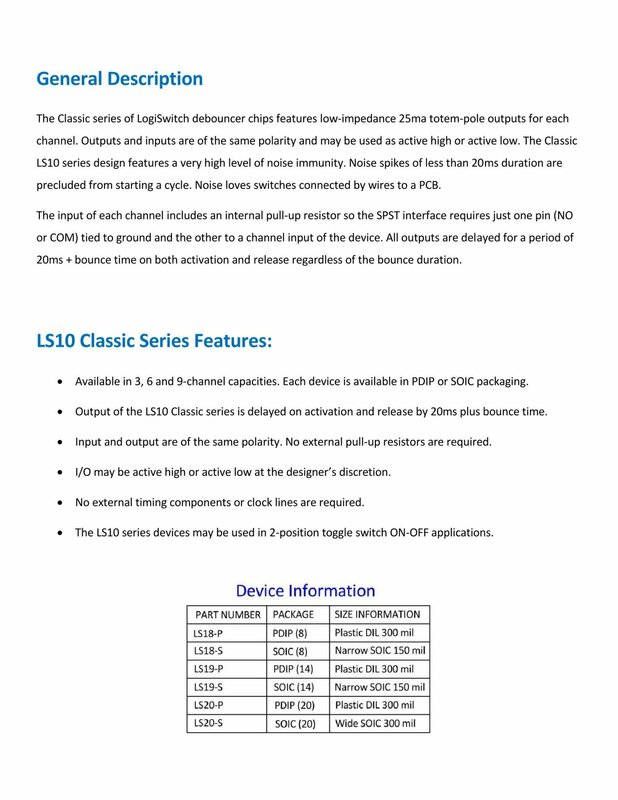 LogiSwitch Classic devices provide 25 milliamp totem-pole outputs. 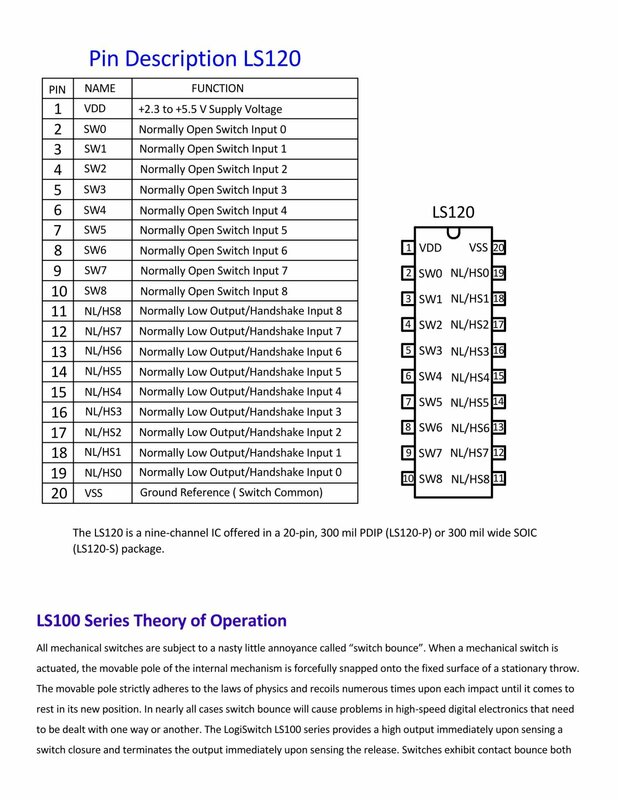 Inputs and outputs are of the same polarity, active high or active low. 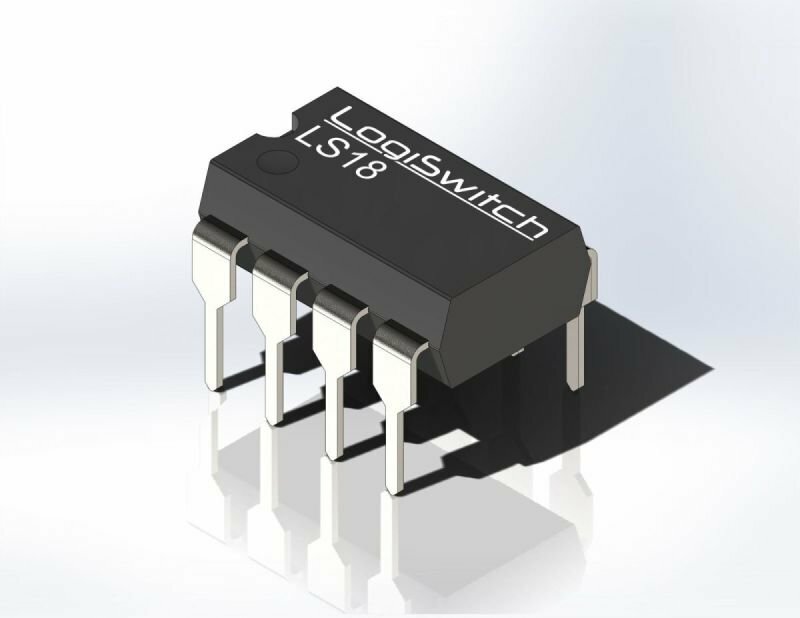 The Classic Original Six-Channel Switch Debouncer IC for Embedded Processors in a 14-pin PDIP package. 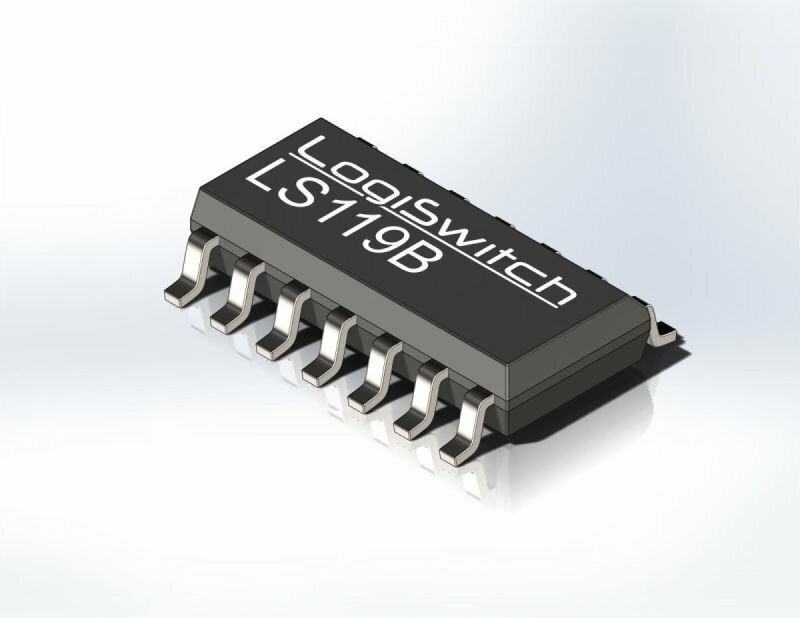 LogiSwitch Classic devices provide 25 milliamp totem-pole outputs. 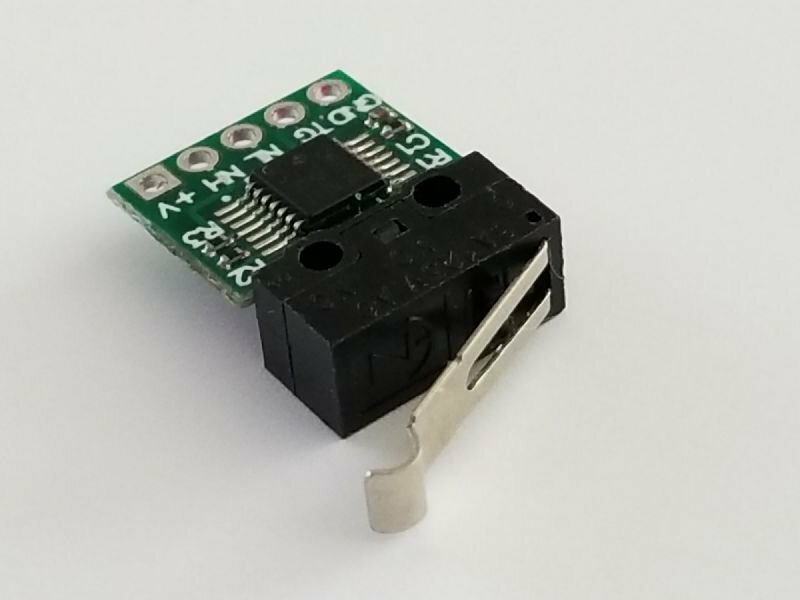 Inputs and outputs are of the same polarity, active high or active low. 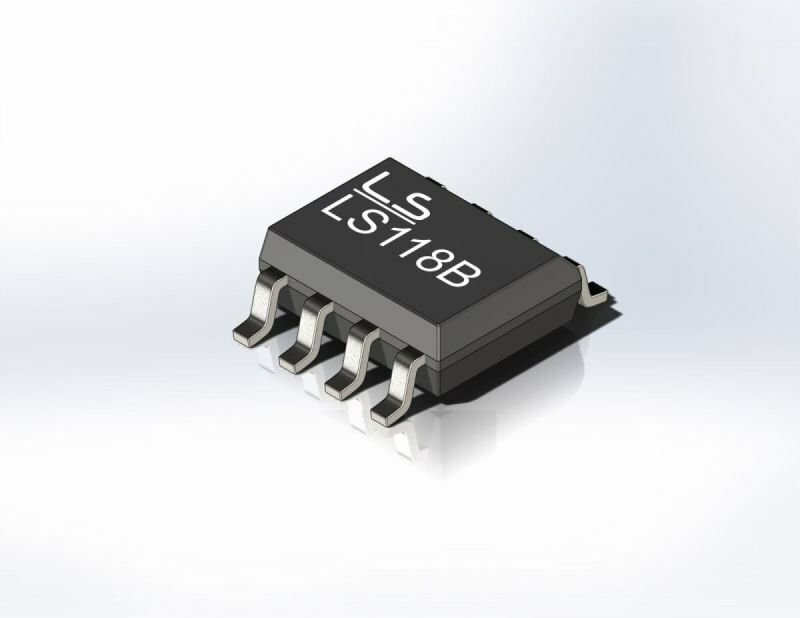 The Classic Original Six-Channel Switch Debouncer IC for Embedded Processors in a 150 mil SOIC-14 package. 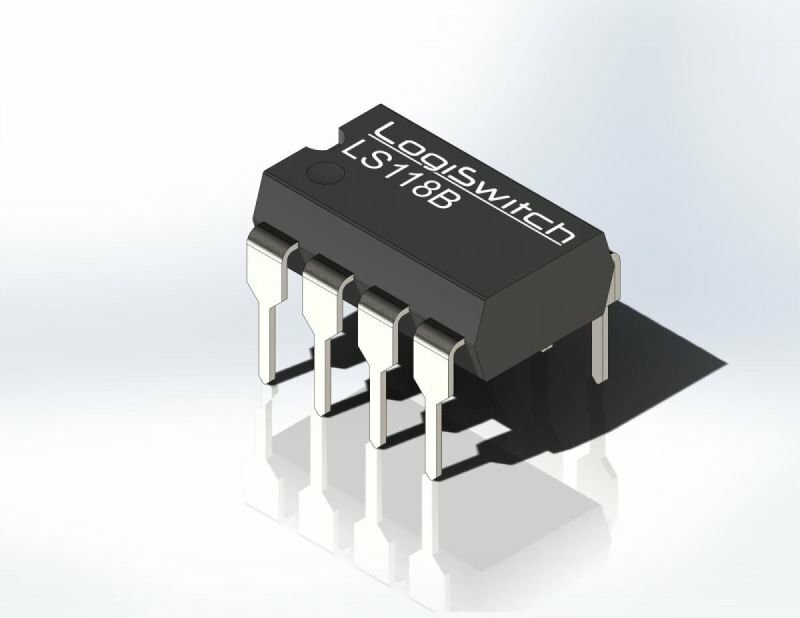 LogiSwitch Classic devices provide 25 milliamp totem-pole outputs. 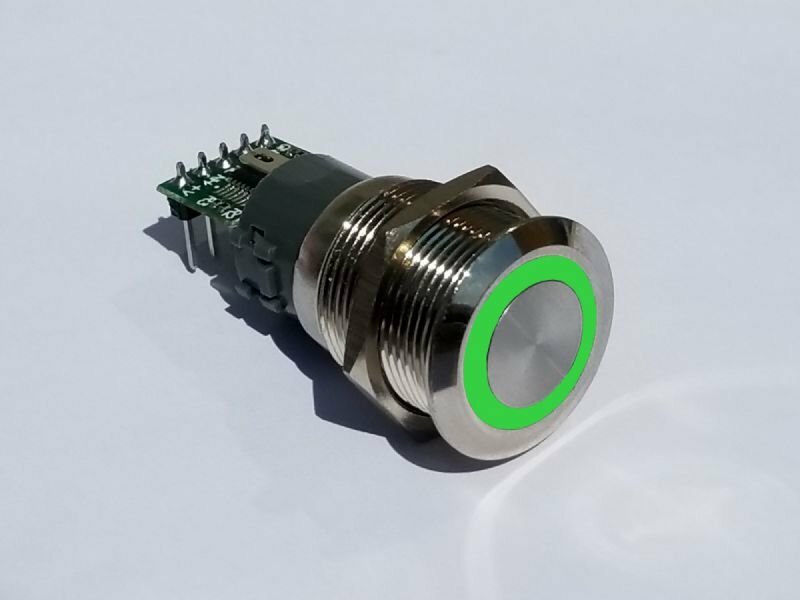 Inputs and outputs are of the same polarity, active high or active low. 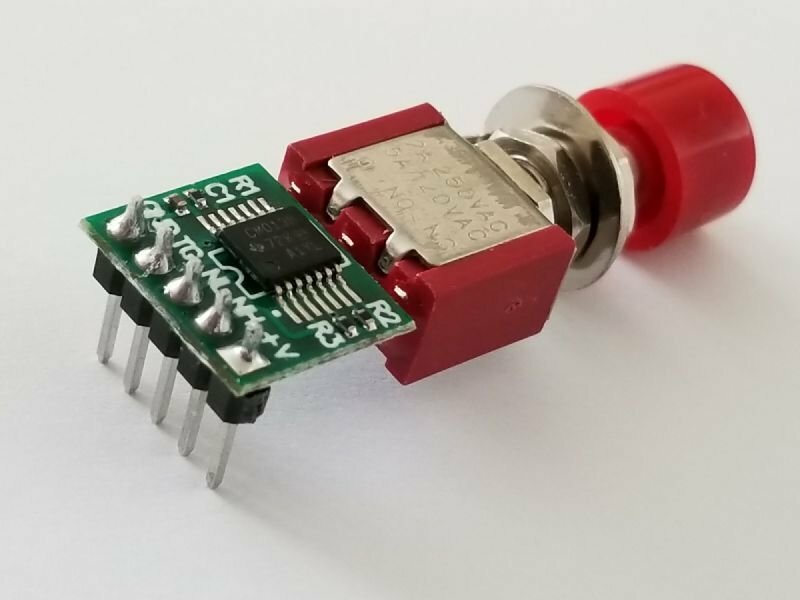 The Classic Original Nine-Channel Switch Debouncer IC for Embedded Processors in a 20-pin PDIP package. 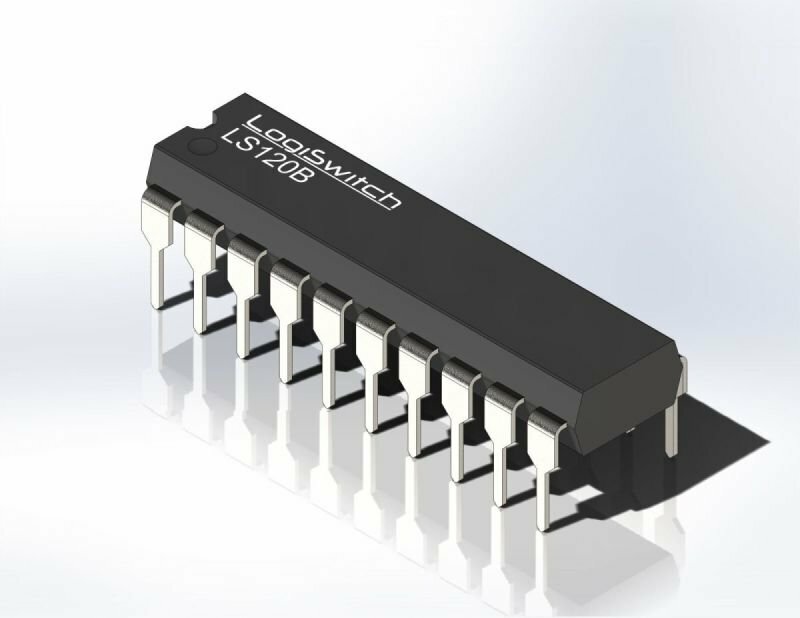 LogiSwitch Classic devices provide 25 milliamp totem-pole outputs. 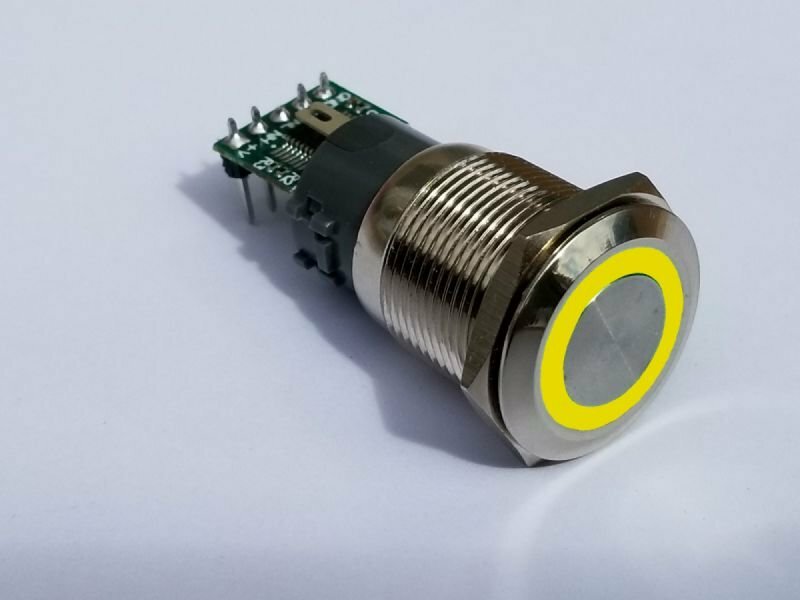 Inputs and outputs are of the same polarity, active high or active low. 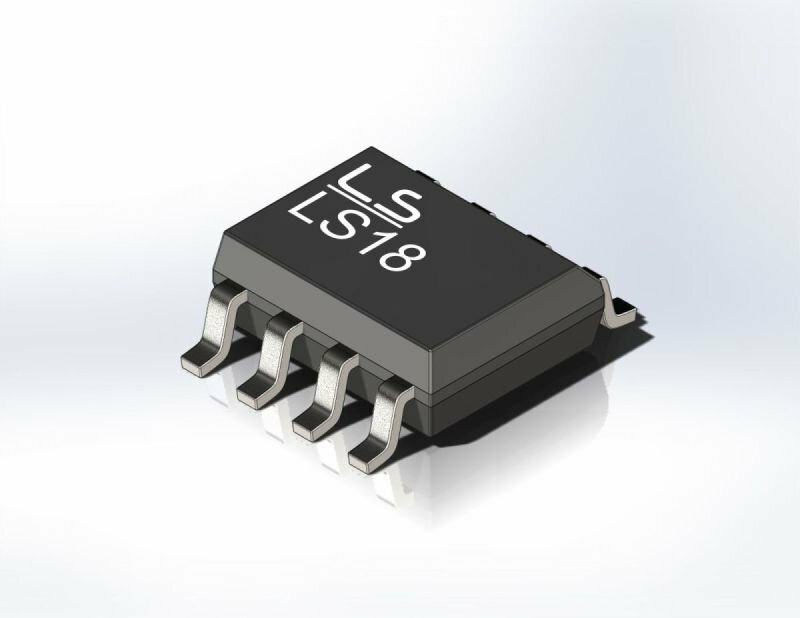 The Classic Original Nine-Channel Switch Debouncer IC for Embedded Processors in a 300 mil SOIC-20 package. 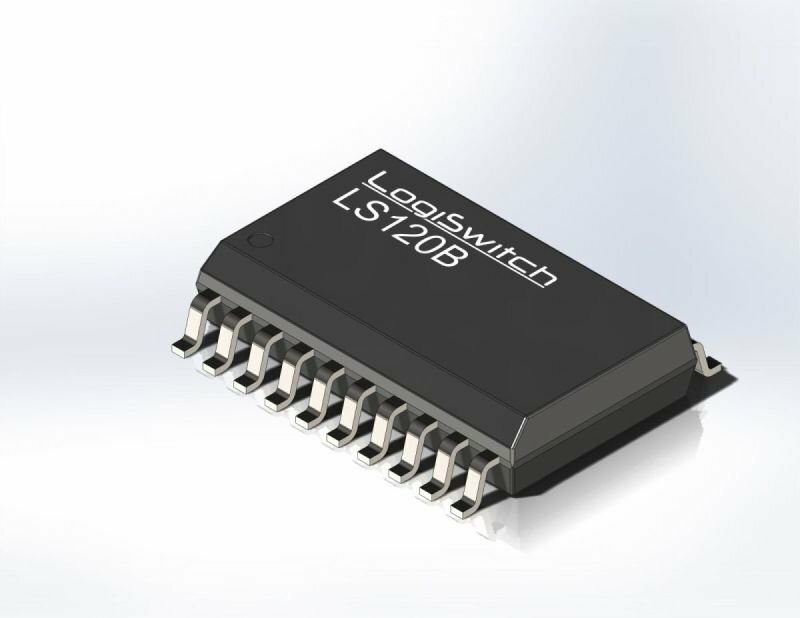 LogiSwitch Classic devices provide 25 milliamp totem-pole outputs. 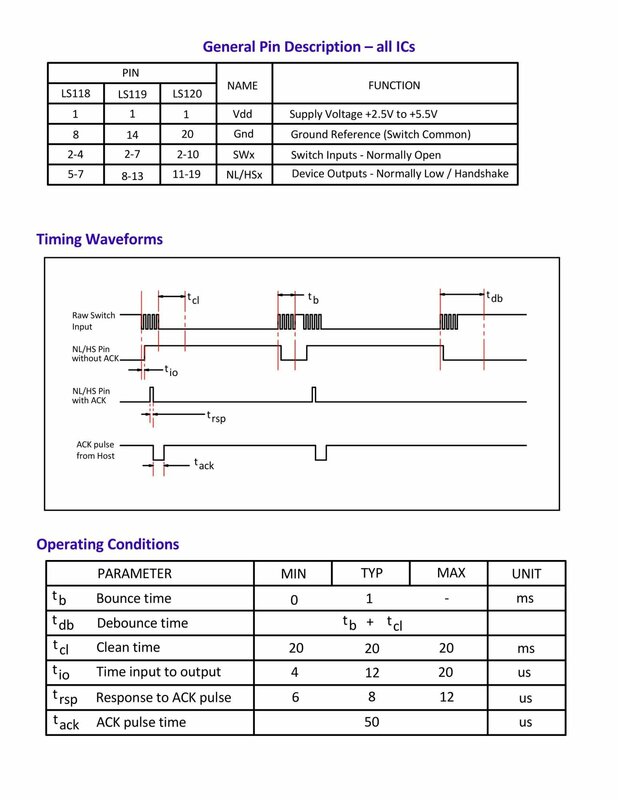 Inputs and outputs are of the same polarity, active high or active low. 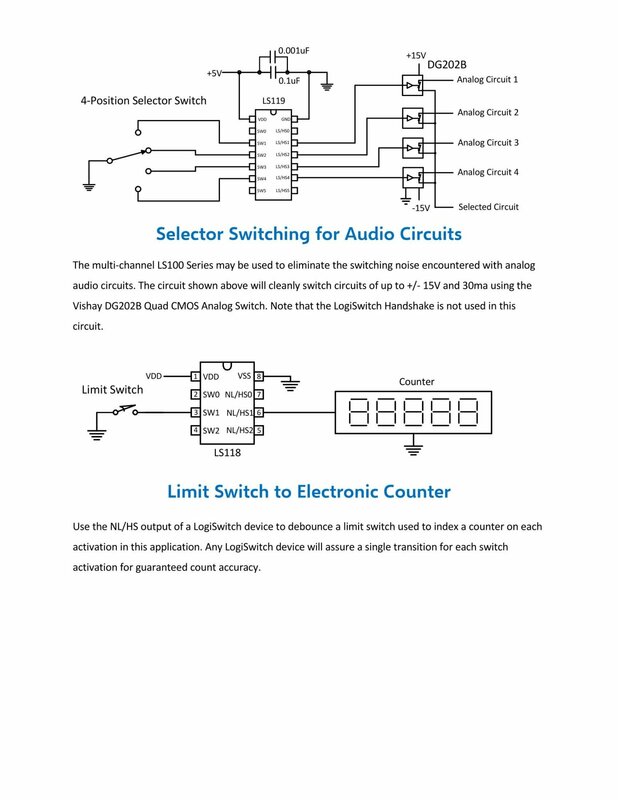 Three-Channel Switch Debouncer for Embedded Processors - Essential for Interrupt Driven or Polled Environments. 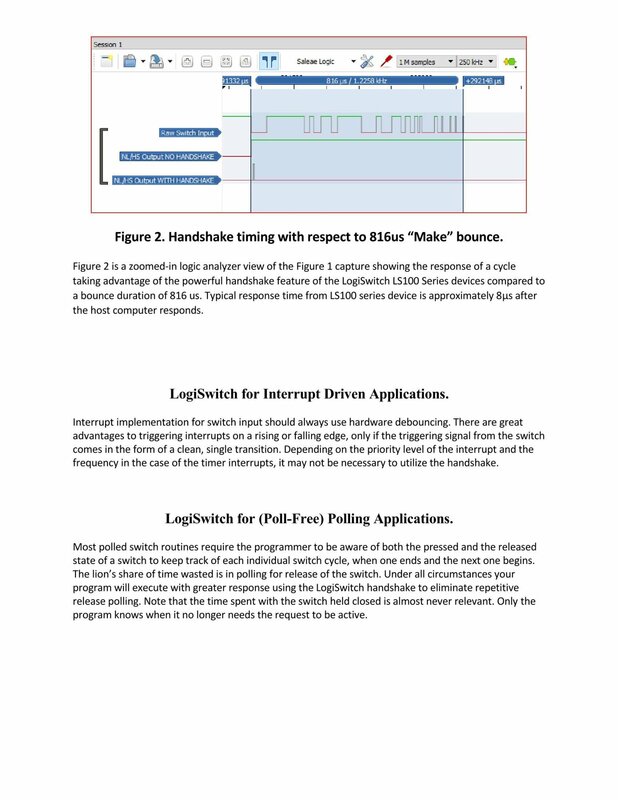 Active-High Outputs with Optional High-speed Handshake Protocol to Eliminate Polling in "Polled" Routines. 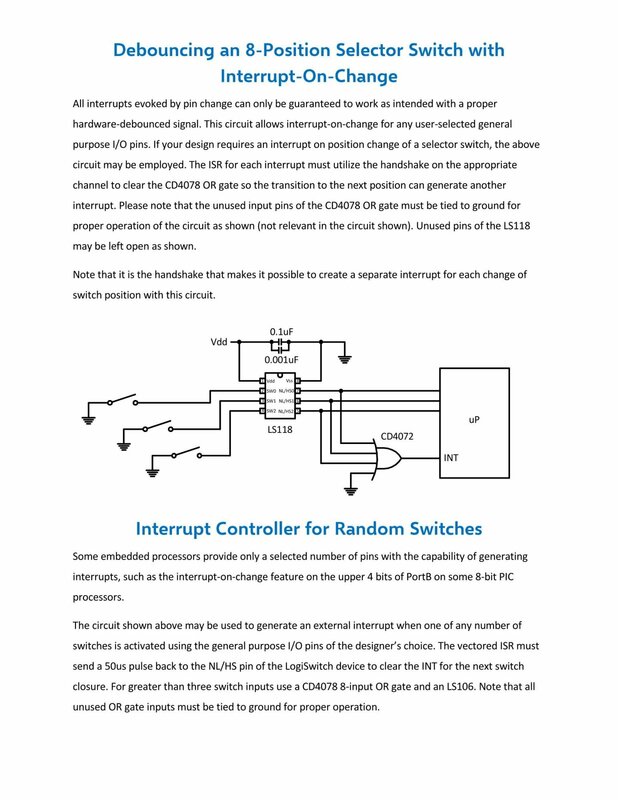 Six-Channel Switch Debouncer for Embedded Processors - Essential for Interrupt Driven or Polled Environments. 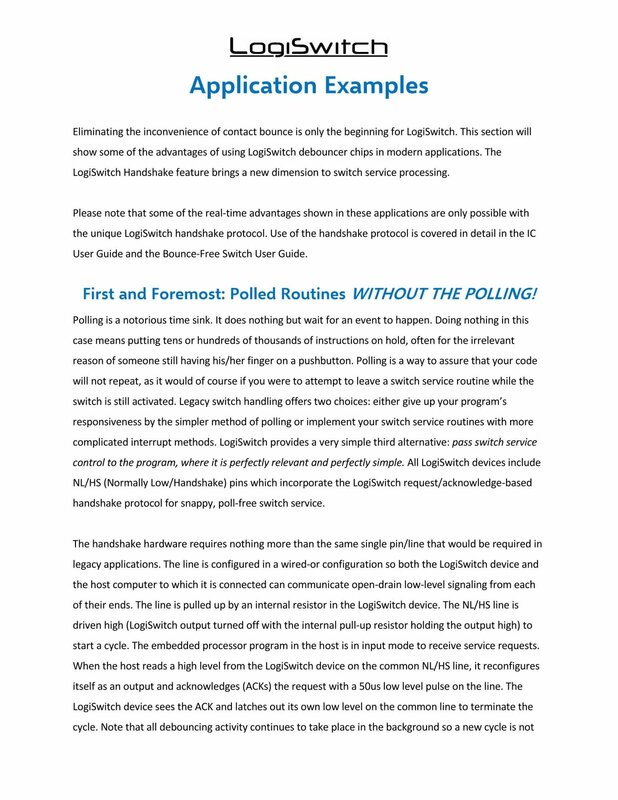 Active-High Outputs with Optional High-speed Handshake Protocol to Eliminate Polling in "Polled" Routines. 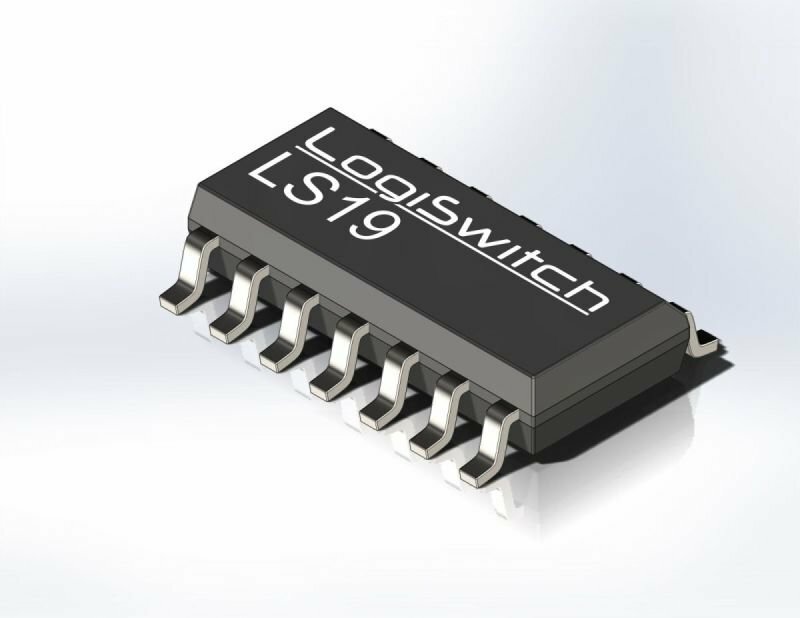 Nine-Channel Switch Debouncer for Embedded Processors - Essential for Interrupt Driven or Polled Environments. 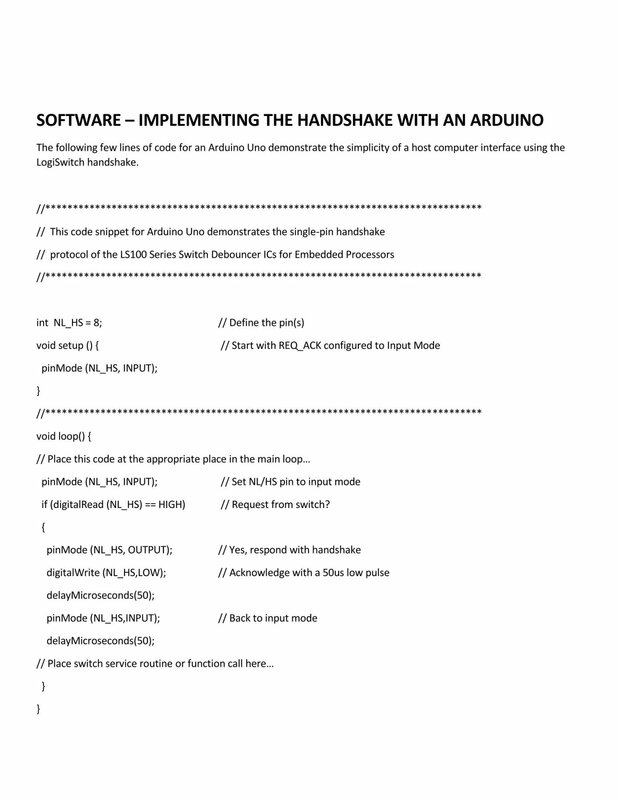 Active-High Outputs with Optional High-speed Handshake Protocol to Eliminate Polling in "Polled" Routines. Attractive panel-mount metal digital switch. IP67 rated - Water resistant and tamper/vandal proof. 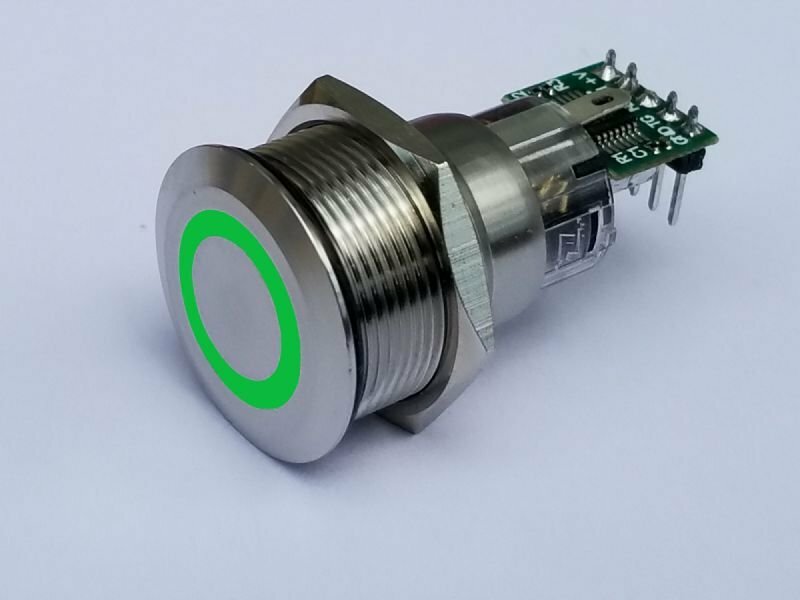 Attractive panel-mount metal digital switch. Water resistant and tamper/vandal proof. 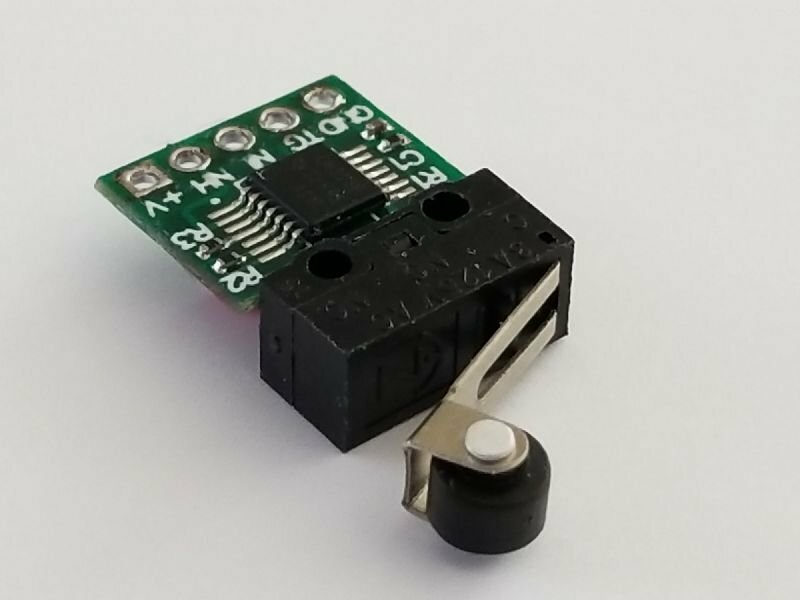 Small 6mm Digital Panel Mount Switch. No Bouncing, No Polling, No Kidding! 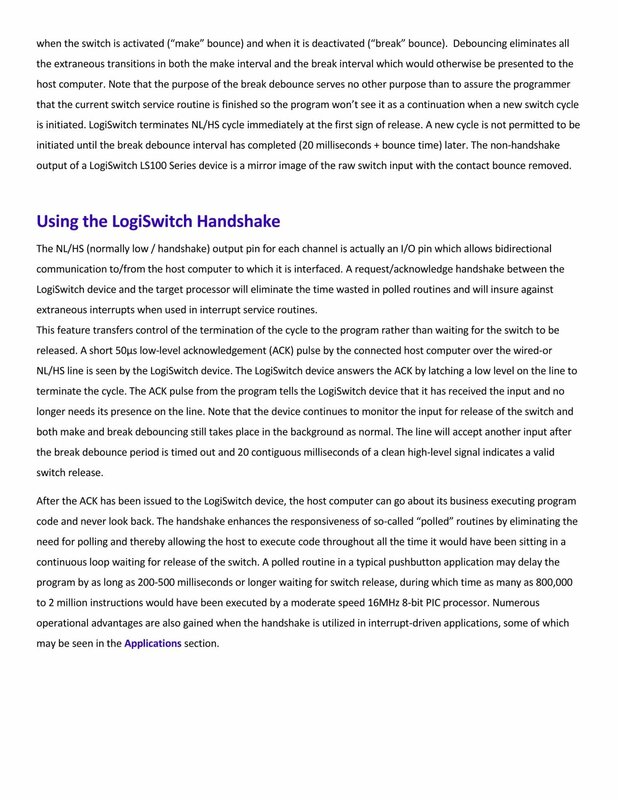 LogiSwitch was founded by Mike Pelkey, whose experience goes all the way back to the dawn of the microprocessor. 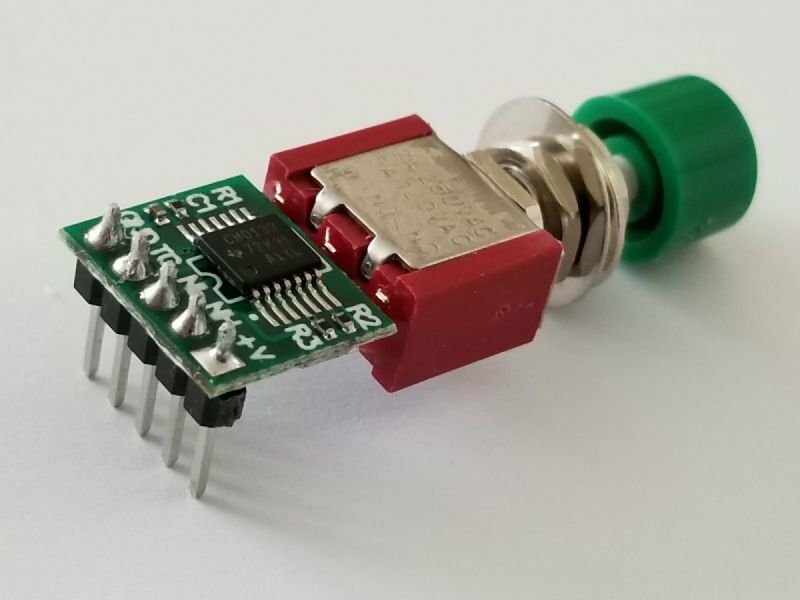 In fact, Mike was the lead engineer for the first microprocessor-based product in the numerical control industry of the day -- a Z-axis controller called the Micro-Z. 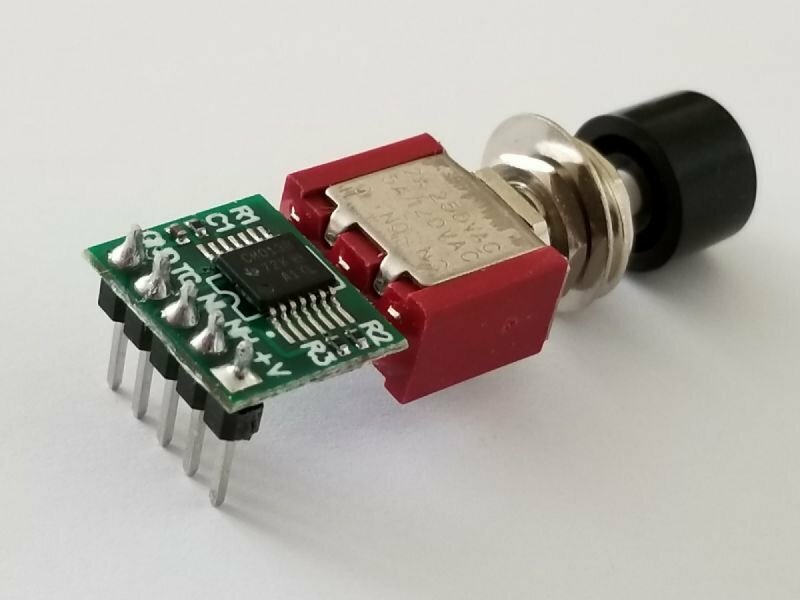 Mike also developed the world’s first networked cash register in the mid-1970s, and he founded Macrotech International Corporation, which was a major manufacturer of board-level computer products in the late-1970s and early-1980s. 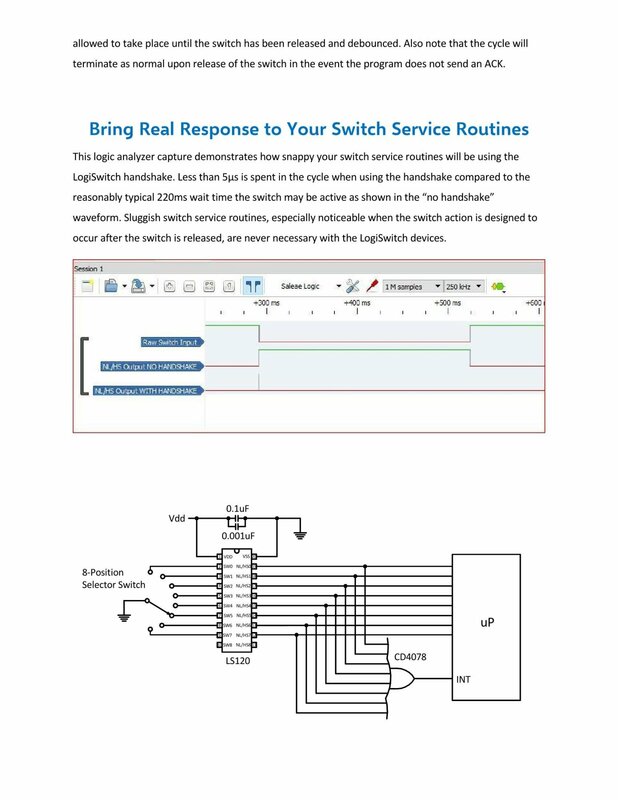 Throughout more than 40 years of designing digital systems, Mike -- like almost every other hardware designer engineer on the planet -- was plagued by the switch bounce problem. 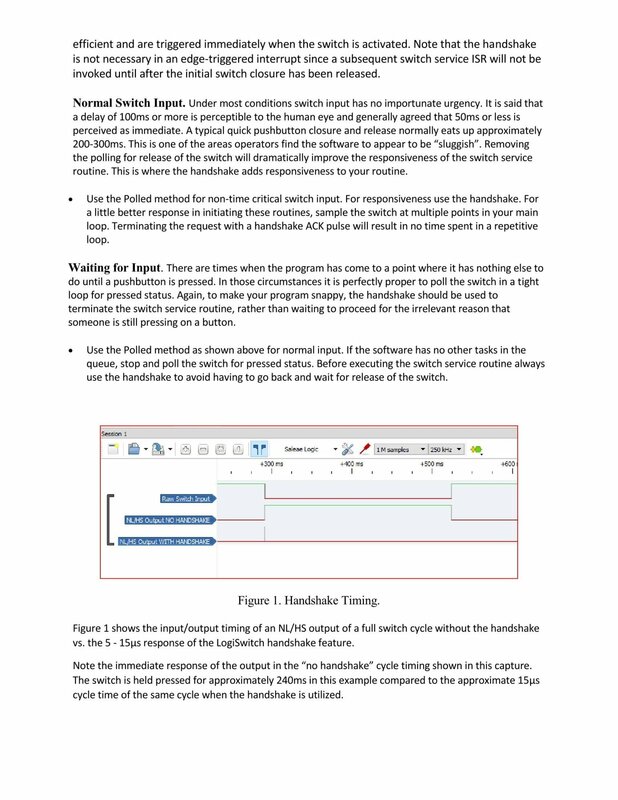 Having employed every version of traditional hardware-based and software-based switch bounce mitigation techniques (see our Switch Bounce/Debounce Tutorial), Mike decided that there had to be a better way. 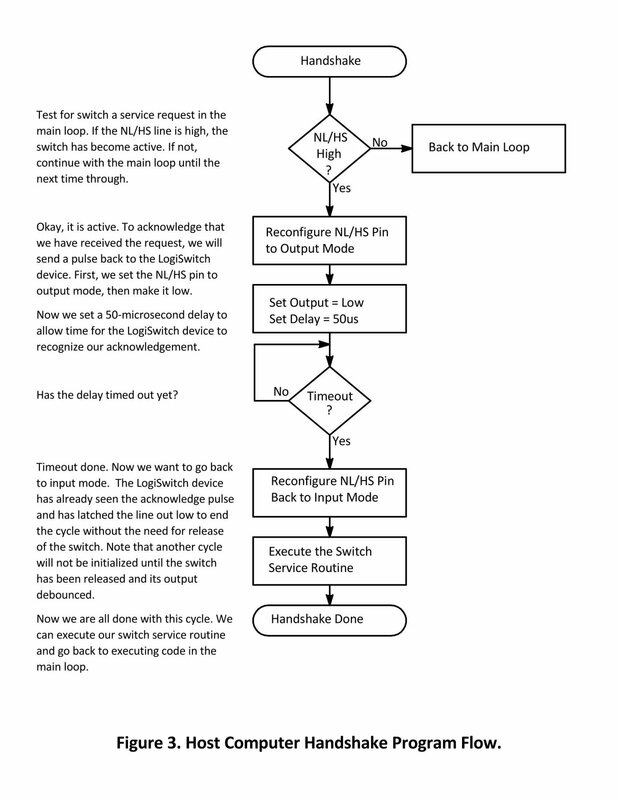 The result of Mike's cogitations and ruminations was the LogiSwitch concept. 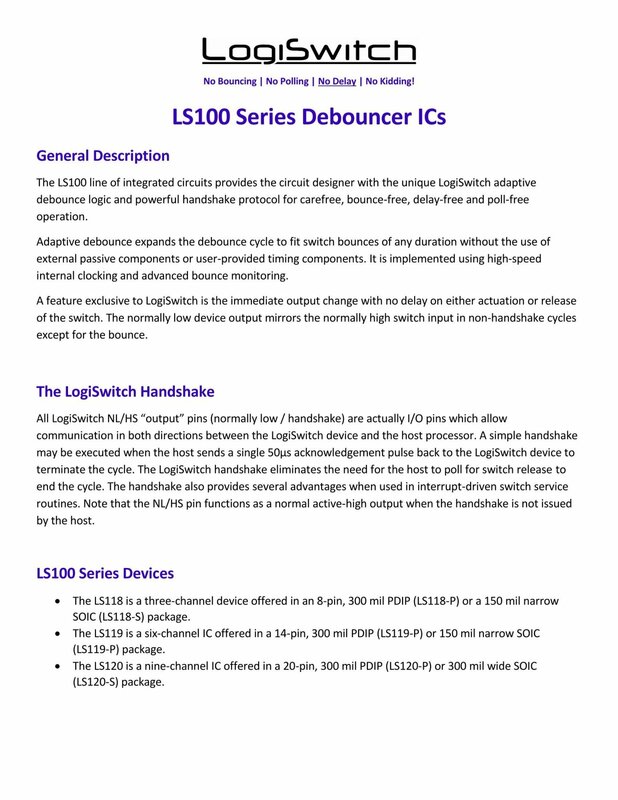 Boasting adaptive bounce detection algorithms and a unique 1-wire handshaking protocol (see LS100 Series Debouncer ICs), low-cost LogiSwitch ICs reflect the state-of-the-art in switch bounce mitigation technology. 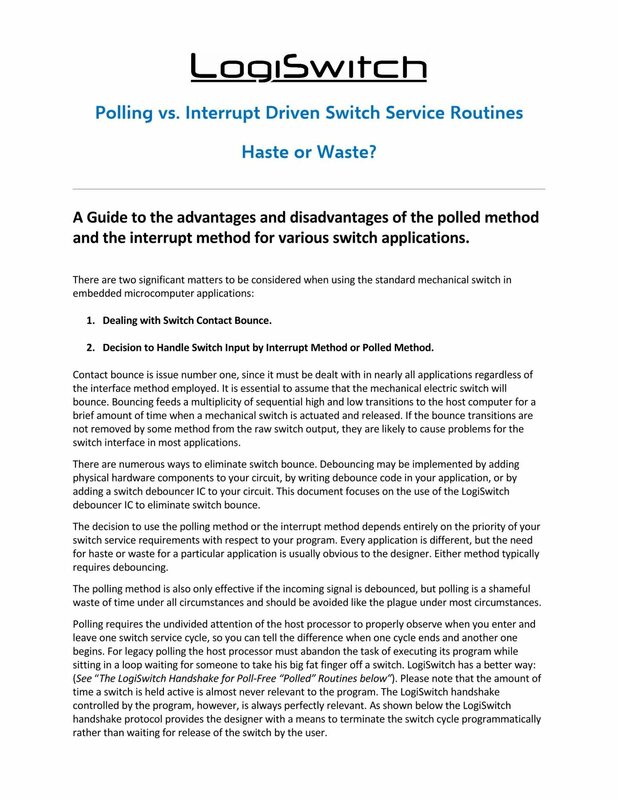 This tutorial is to demonstrate all five methods for debouncing switches using single pole-single throw, or single pole-double throw switches. The guide includes the two methods for single pole-double throw (SPDT) switches which require no output delay and the two best methods for interfacing with the more simple single pole-single throw (SPST) switches. 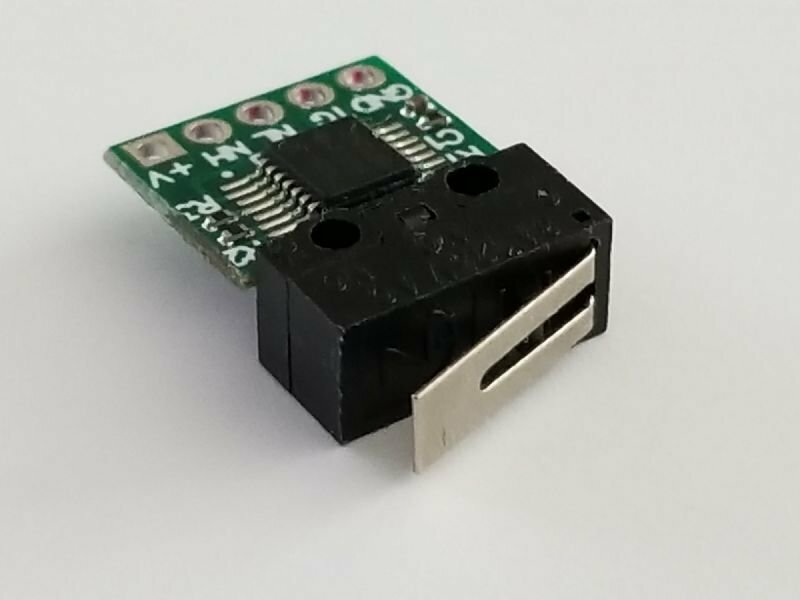 If you can spare two pins, this is the way to go. 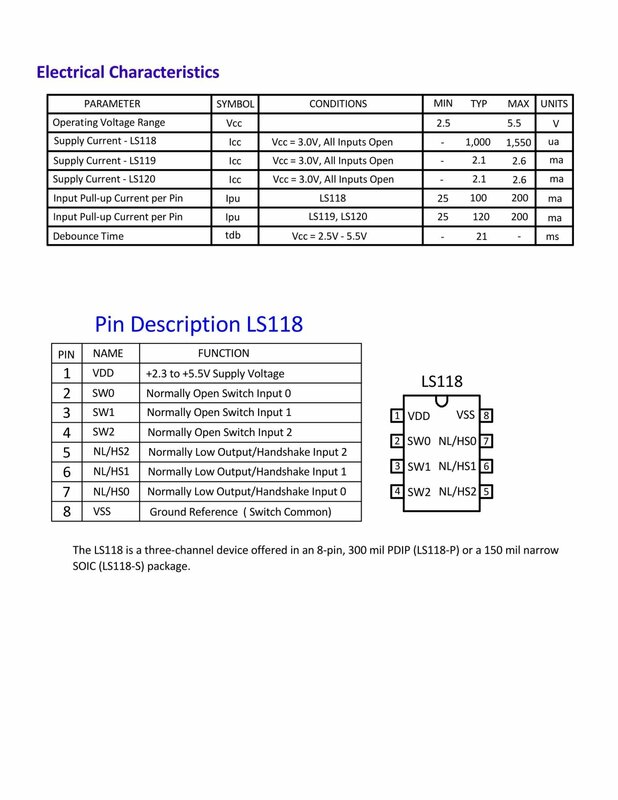 Using a SPDT switch, Pin 1 Low indicates the switch is inactive, and Pin 2 Low indicates it is activated. 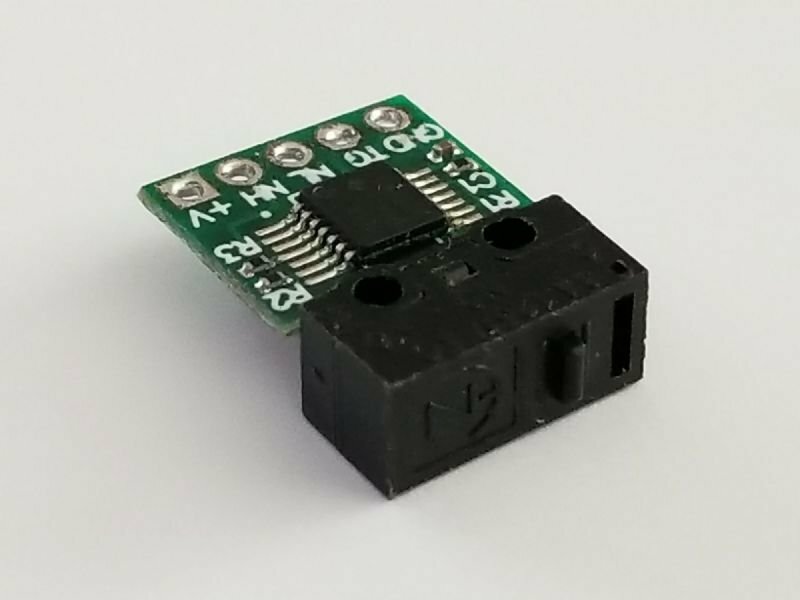 The cross-coupled nand gate method is ideal for projects where two processor pins are not available for use with one switch. 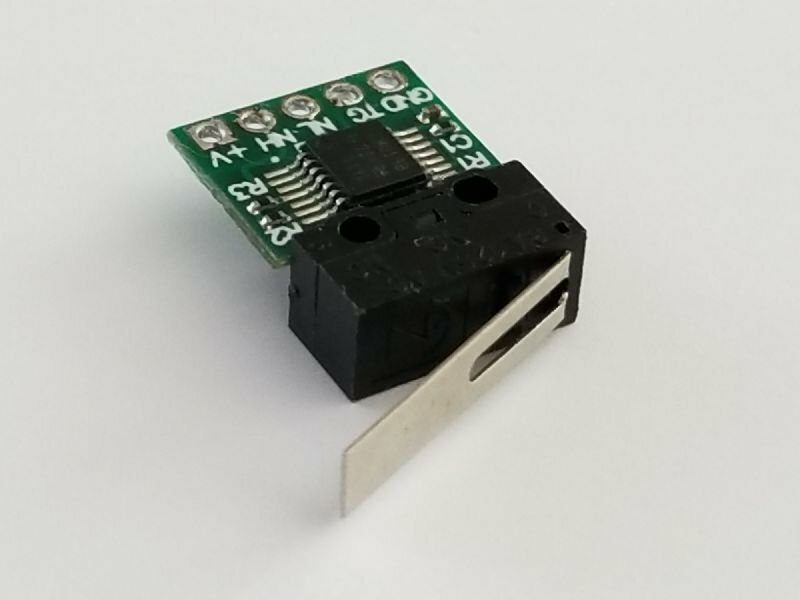 Using the internal cross-coupled nand gating of a D-Type Flip flop provides an excellent Method 3 Debounce identical to Method 2. Note the Q output is normally high and goes low when the switch is activated. METHOD 4. 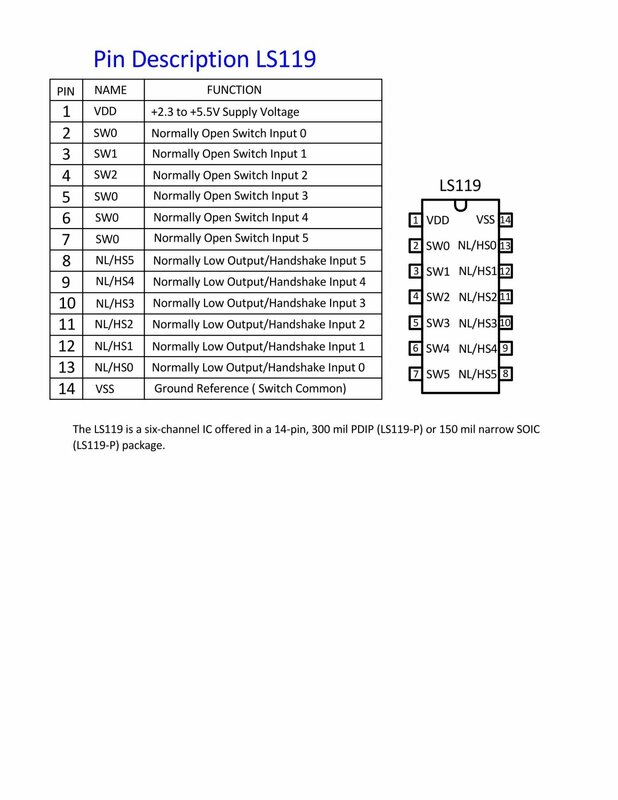 HARDWARE DEBOUNCE FOR SPST SWITCHES. 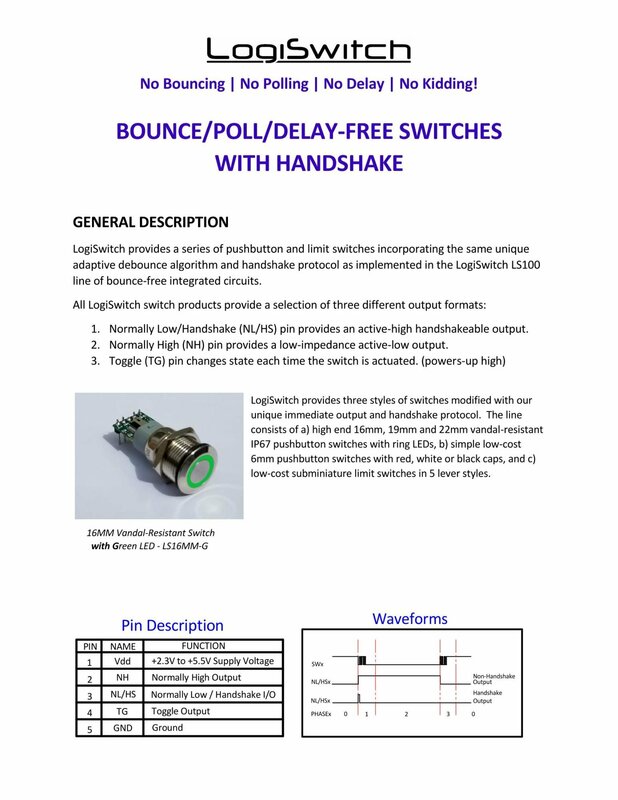 Whenever a single pole-single throw (SPST) switch is used for input into high-speed digital devices, the only thing you can do is to wait out the bounce interval with either hardware or software delays (see Waveform 2 below). 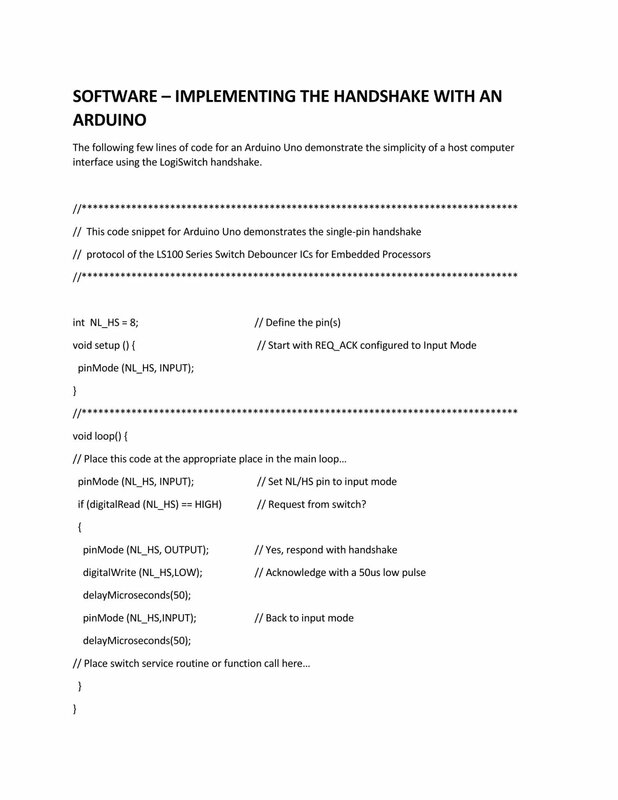 There are numerous examples online for software debounce routines for every computer language known to mankind. They all amount to simply waiting out the estimated bounce period. WAVEFORM 1. 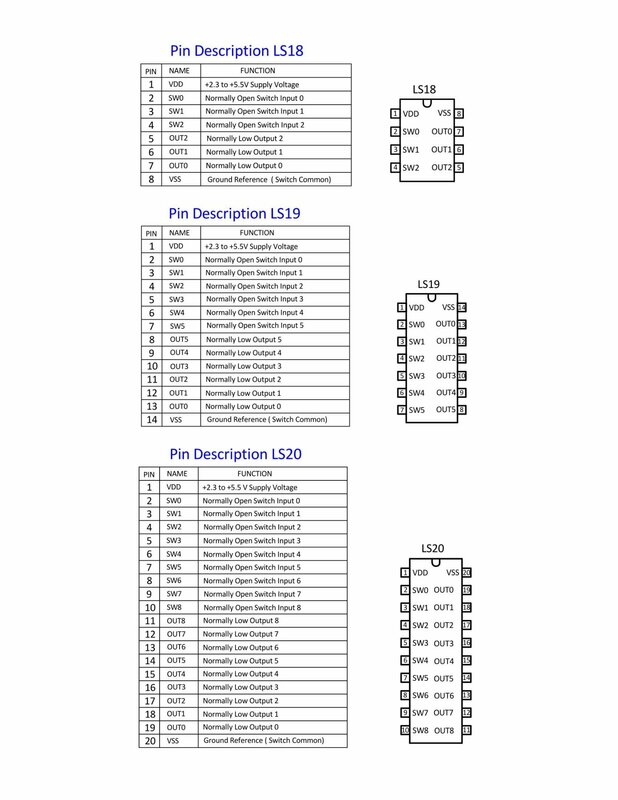 CROSS-COUPLED NAND AND 2-PIN DEBOUNCE METHODS. 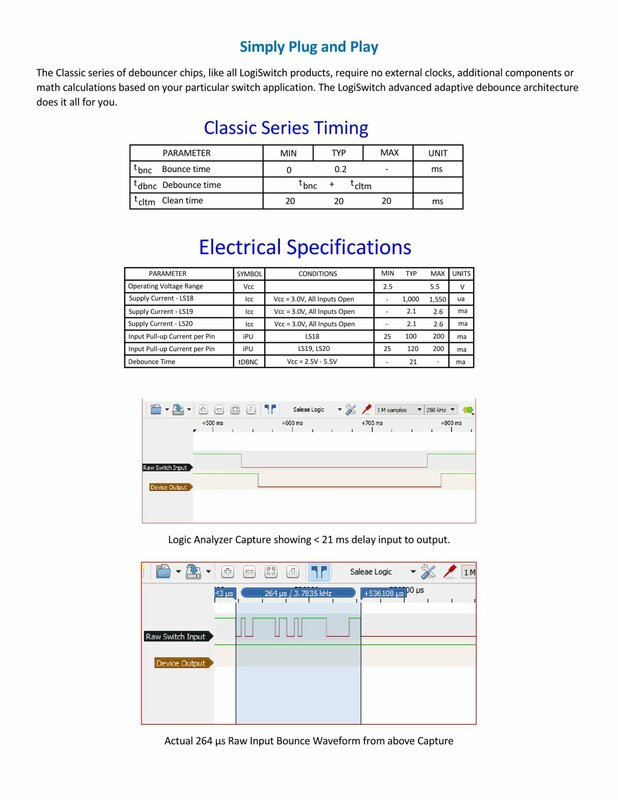 Note the immediate Q output. 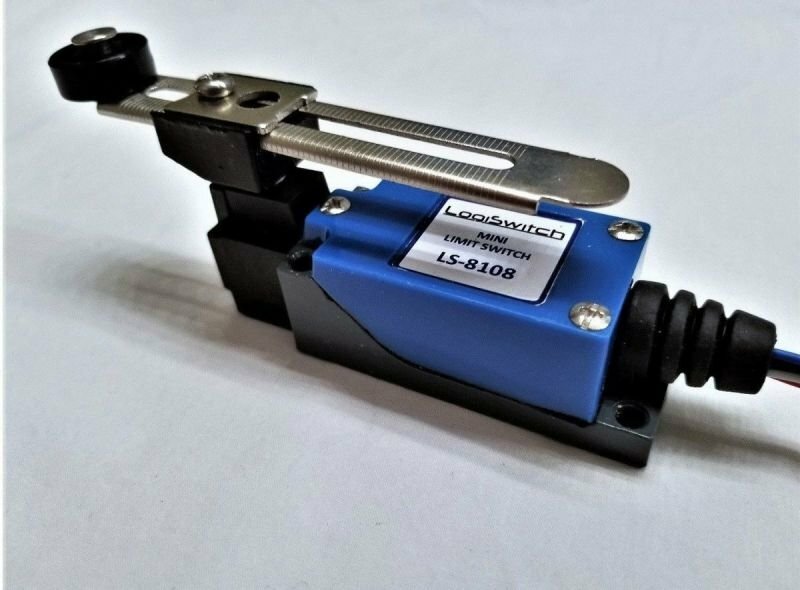 Methods 1 and 2 change the output state with no delay both on actuation and release. WAVEFORM 2. 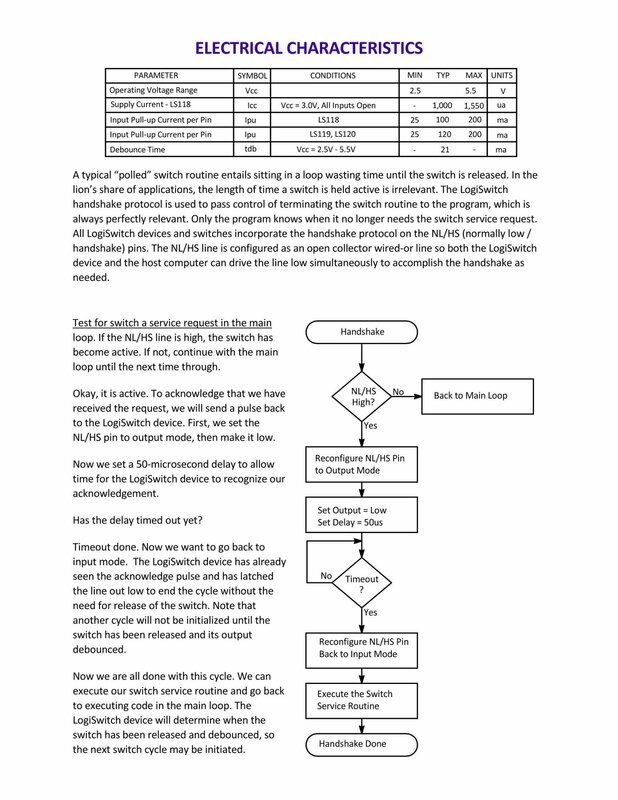 SPST AND SOFTWARE DELAY METHODS. 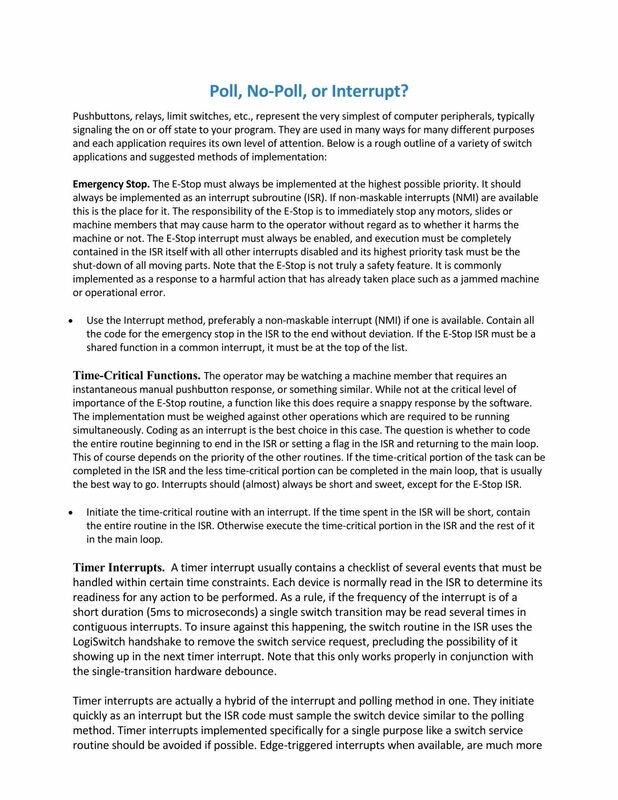 Note the delayed Q output for these methods. 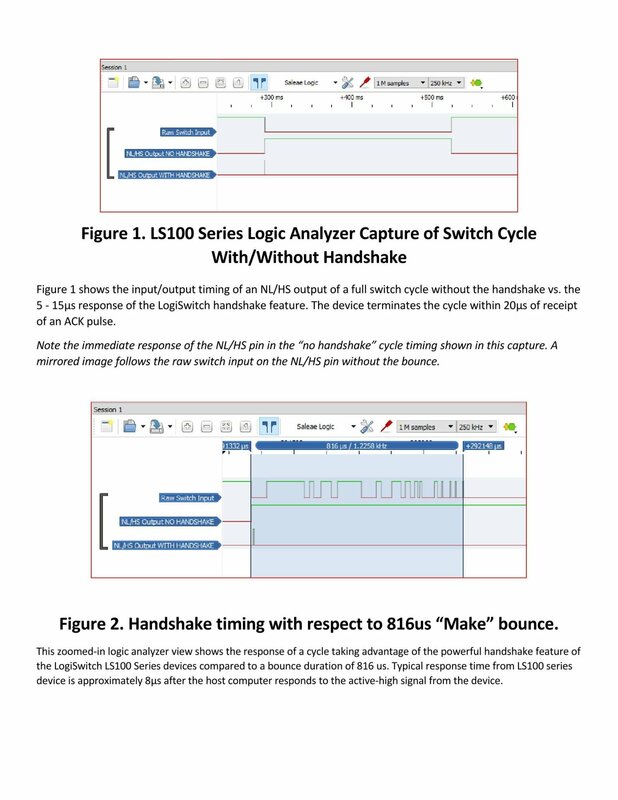 The Hardware Debounce circuit of Method 4 and Software Debounce of Method 5 require delaying action until the bounce time is through.